Nutra-Nuggets Large Breed Adult Dog Formula is specially formulated for the nutritional needs of adult dogs whose ideal weight is 25kg or more. This highly digestible formula contains an optimal fatty acid balance, added levels of glucosamine and chondroitin to help maintain joint health and reduced fat to help maintain a healthy weight. Chicken meal, brewers dried rice, barley, brown rice, rice bran, chicken fat, dried plain beet pulp, chicken digest, fish meal, linseed, glucosamine hydrochloride (0.03%) and chondroitin sulphate (0.01%). 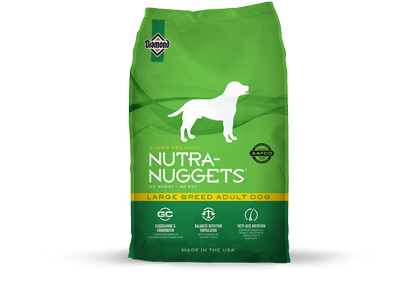 Nutra-Nuggets Large Breed Adult Dog Formula is formulated to meet the nutritional levels established by the AAFCO Dog Food Nutrient Profiles for maintenance.